CHDS faculty James Hammitt and Lisa Robinson organized sessions at the Society for Benefit-Cost Analysis’ annual meeting in Washington DC this past March. These included a professional development workshop, a panel benefit-cost analysis in low- and middle-income countries, and a round table discussion on regulatory benefit-cost analysis under the current Administration. The professional development workshop addressed valuing improved health and longevity, which account for the majority of the quantified benefits of environmental, health, and safety policies and regulations. Because these risk reductions are not directly bought and sold in the marketplace, economists have developed a range of methods to estimate their value, focusing on individuals’ willingness to pay (WTP) for the benefits they receive. Experts discussed the underlying concepts, the methods used for valuation, and the application of the results as well as related guidance. The workshop focused on estimates applicable in the contexts of interest to workshop participants, discussing common defaults and practices in different countries and different policy areas. In “Methods for Benefit-Cost Analysis in Low- and Middle-Income Countries”, participants provided an overview of the work Robinson and Hammitt have led over the past year in developing guidance on conducting benefit-cost analysis of health and development policies in low- and middle-income countries. The goal of the session was to solicit feedback from the audience, to aid in shaping the ultimate recommendations. Topics included methods for valuing mortality risk reductions, valuing nonfatal health risk reductions, and estimating economy-wide effects. The project is funded by the Bill & Melinda Gates Foundation. The roundtable discussion addressed the current administration’s initiatives that affect the U.S. regulatory development process and the conduct of regulatory analysis, many of which are a result of the substantially increased focus on deregulation. In this session, experts discussed anticipating the need for retrospective evaluation when designing new regulations, conducting and using the results of retrospective analyses, and improving prospective analyses of regulatory and deregulatory actions. 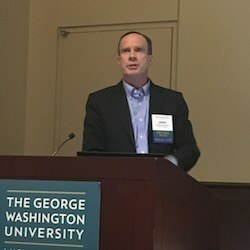 This session built on a September 2017 discussion hosted by the Society for Benefit-Cost Analysis, the George Washington University Regulatory Studies Center, and the Administrative Conference of the United States, which can be viewed here. Several participants have drafted papers that will appear soon in a special series in the Penn Program on Regulation’s “Regulatory Review”. Learn more: Visit the Guidelines for Benefit-Cost Analysis project webpage and explore resources from the workshop on global health and development (November 2017) in the CHDS repository. Learn more: Visit the Benefit-Cost Analysis page on the CHDS website and explore other decision science topics here.